07:00:00 Makes 24 servings, 2 pieces (15 g) each. Makes 24 servings, 2 pieces (15 g) each. Homemade doesn't have to mean hard to make. This simple homemade marshmallow recipe is sure to become a new family favourite. Bring water to boil in small saucepan. Add jelly powder; cook and stir on low heat 2 to 4 min. or until jelly is dissolved. Add granulated sugar; cook and stir 3 to 4 min. or just until sugar is dissolved. (Do not boil.) Stir in corn syrup. Transfer to large bowl. Refrigerate 25 to 30 min. or until lukewarm. Line 8-inch square pan with waxed paper; spray with cooking spray. Beat jelly mixture with mixer on high speed 10 to 12 min. or until stiff. Transfer to prepared pan; spread gently to form even layer. Refrigerate 6 hours or until firm. Unmold dessert onto work surface dusted with half the icing sugar; peel off waxed paper. Sprinkle dessert with remaining icing sugar; cut into 48 pieces. Roll cut edges in remaining icing sugar to evenly coat. Prepare using your favourite flavour of Jell-O Jelly Powder, such as Lemon, Lime, Orange or Raspberry. Prepare dessert as directed but do not cut into pieces. Refrigerate up to 2 days before unmolding, cutting into pieces and coating with icing sugar as directed. 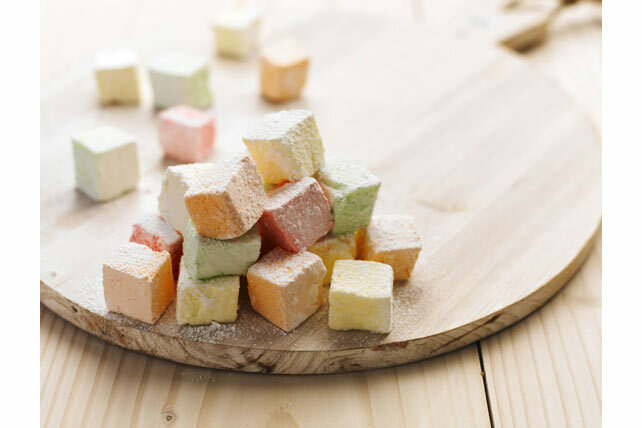 Since moisture from the chilled marshmallows will cause the sugar coating to dissolve, do not cut the marshmallows and coat with sugar until just before serving. Serving Size Makes 24 servings, 2 pieces (15 g) each.